A webcomic by Gump n Hell retelling the plight of Nuril. Used with permission. Captions translated below. A woman was sentenced to six months in prison by Indonesia's Supreme Court in early November for recording a sexually explicit phone call she received from her boss, who had been harassing her at work. Public outrage over the verdict has forced the Office of the Attorney General to temporarily suspend her imprisonment. 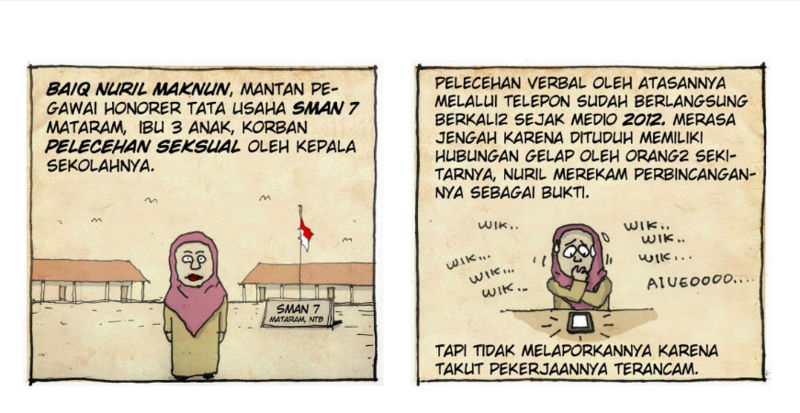 Baiq Nuril Maknun, a 37-year-old mother of three and teacher at Mataram in West Nusa Tenggara (NTB) Province, was reported by the school’s head master for defamation in 2017 after she recorded a phone conversation in which he boasted of his sexual relationship with another teacher at the school. After she shared the recording with another colleague, it circulated on a WhatsApp messaging group. Indonesian law does not address the legality of recording a phone call without both parties’ prior consent. Nuril said that the head master, who is named Muslim (it is common in Indonesia for a person to be known by a single name) would harass and proposition her, often bragging about his sexual relations with another teacher at school. On several occasions, she said he invited her to meet him at a hotel for a “tryst”. She did not report the harassment, for fear of losing her job. But then she began to hear rumors that she herself was maintaining an extramarital relationship with her superior. She decided to record her phone conversations with her boss, in an effort to gather evidence of what was happening, in case she should need to assert her innocence. But the recording was posted by one of Nuril’s colleagues on WhatsApp and eventually reached many members of the school community. Muslim was forced to resign, but was later hired by a local-level youth and sport agency. A webcomic by Gump n Hell retelling the plight of Nuril. Used with permission. Comic translation, by panel, starting at top left. 1. Baiq Nuril, a former administrative teacher of SMAN 7 state high school, mother of three, a sexual harassment victim. 2. The man has verbally harassed her since mid-2012. Tired of being accused of having extramarital affairs with the man, she recorded one of his calls, but didn't report it out of fear of losing her job. 3. Her colleague posted the recording on a WhatsApp group. Out of shame, her boss pressed charges against her using UU ITE. 4. Mataram District Court dismissed her from all charges, but Supreme Court punished her, while her harasser got a promotion within the City of Mataram. 5. The children discuss how other sexual violence victims are being sidelined by the justice system. In retaliation, Muslim sued Nuril for defamation. The Mataram District Court acquitted Nuril and declared her to be a victim of sexual harassment. But the prosecution appealed the ruling in the Indonesian Supreme Court which found that Nuril had violated the Electronic Information and Transactions (UU ITE) law, which falls under Indonesia's criminal code. In addition to serving a six-month prison sentence, Nuril was ordered to pay a fine of 500 billion Rupiah (nearly USD $34,000). Public school teachers in NTB province typically earn USD $125 per month. Various groups have helped launch the #SaveIbuNuril campaign aimed at defending Nuril’s freedom. Indonesians call someone “Ibu” as a sign of respect and affection for a female teacher, or an older maternal figure. An online petition demanding President Joko Widodo (Jokowi) grant amnesty to Nuril has been signed by more than 162,000 people. But despite the overwhelming public support for Nuril, Jokowi says he won't intervene with the Supreme Court's decision. He has advised Nuril to seek a case review or apply for grasi (presidential clemency) when her punishment is in force. The Institute for Criminal Justice Reform (ICJR) criticized the president's statement and questioned his commitment to protect women and other victims of sexual harassment in the country. A crowdfunding campaign was also initiated to pay Nuril’s fine. As of this writing, the campaign has already raised USD $22,500. Nuril’s case has further highlighted the need to review Article 27 of the UU ITE law. According to the Southeast Asia Freedom of Expression Network (SAFENet), this provision is often used by those in government to silence their critics. SAFENet has monitored 245 cases linked to the UU ITE law, 174 of which are defamation-related. Responding to the petition to reform the UU ITE law, Indonesian Minister of Communication and Information (Menkominfo) Rudiantara emphasized that while he sympathizes with Nuril's plight, he insisted that the law needs no revisions. He added that the police should track down the real culprit who spread the recording made by Nuril. His response worried digital rights groups, who fear the vague law will not be amended and that more victims may face the same fate as Nuril in the future. Succumbing to the public pressure, the Office of the Attorney General decided on 19 November 2018 to postpone Nuril’s punishment. In the meantime, there have been no legal measures taken against Muslim, despite the first instance court ruling and evidence that he sexually harassed multiple teachers who were once among his staff. Mataram, the city where he is now employed as chief of the Division of Youth and Sport, has vowed not to take action against him.